Watch to learn more about the industry-leading products coming off PRO-TEC’s Continuous Annealing Line. PRO-TEC is a leader in processing steel, including advanced high-strength grades, helping automakers build cars that are lighter and safer. PRO-TEC steel products primarily are used in the automotive industry. This includes steel for exposed parts (doors, fenders, hood skins, etc.) as well as unexposed structural parts (door supports, floor pans, hood bracing, etc.). PRO-TEC steel also is used in the appliance industry for exposed surfaces of many household appliances, such as washers and dryers, refrigerators, etc. The CAL, launched in 2013, features a state-of-the-art annealing furnace, water quench technology for precision cooling, temper rolling and tension leveling. 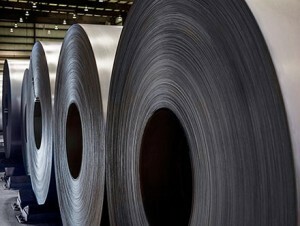 It creates the most advanced cold-rolled, high-strength steel in the world. These lines apply precise weights of zinc coating to high-strength steel substrate to meet exacting customer specifications. Coupled with steel’s inherent recyclability and environmental performance, PRO-TEC’s value-added steels are a material of choice for automotive markets for design flexibility and production demands.